Maa rajma ki daal or rajma wali daal ( it can be Dahl/ dal/ daal/Manh ki daal ) as I call it, is a mix of whole black urad lentils and red kidney beans. 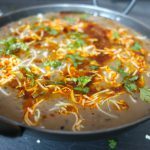 It is a quite similar to the Famous ,rich “Daal Makhni”, as in, it has the same ingredients and similar way of cooking it , but just that it is lighter compared to ‘daal makhni’ . Daal Makhni if cooked in its authentic style is loaded with tomatoes, butter, cream and ghee- that ultimately makes the daal earn its name and its taste, as “Makhni” or “Buttery”, but this version of Maa rajma daal, uses a good amount of pure ghee but lesser than the makhni version, it uses little cream(Indian malai) and no butter. My recipe doesn’t have tomatoes as well. This daal though is lighter in comparison to the Makhni daal, but in itself is quite rich and creamy. 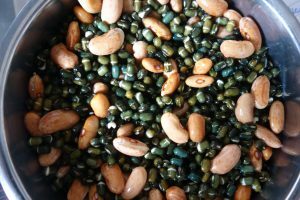 Whole urad daal is one of the really really healthy variety of lentils, and has a number of health benefits, apart from being the storehouse of energy. All whole pulses , including this one, is a little heavy to digest , hence addition of a good amount of ghee, garlic, hing (asafoetida) along with fenugreek seeds and other Indian whole spices (details are mentioned in the recipe below) ensure that this is easily digestable and also add a beautiful aroma and taste to this lovely dish. There are a number of ways to cook this daal, and a number of ways to temper it using different spices.Most of the versions use tomato , but this recipe is without the use of tomatoes, and believe me having had this since childhood , I never felt that this recipe called for tomatoes. No particular reason for not adding tomatoes, it tastes as amazing with the tomatoes as well.Those who love tomatoes can surely add it at the time of tempering. But the recipe that I’m sharing today , is my mothers recipe, and is exactly the way she cooks it, and exactly the way I love it. For now, talking about the cooking time of this daal, traditionally this is one of the recipes that would be slow cooked over a clay oven for about and 10-12 hours or over night. 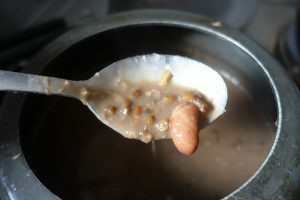 But thanks to the modern gadgets, namely pressure cooker this recipe can be cooked in 2-3 hours,leaving aside the time you need to soak the lentils (overnight).It takes so much time because to taste good, these lentils and beans need to get a mushy consistency.You need to make sure these are all nice , creamy and mushy (something like in the below pictures) ,before you get on with tempering . 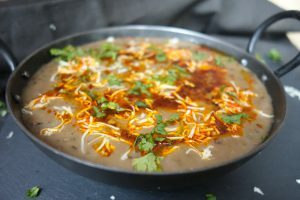 Yes, this is a really really time consuming recipe, but worth it all, in the end when the deliciousness and creaminess, enhanced by the flavours of the daal ,spices and ghee, just melts into your mouth !! 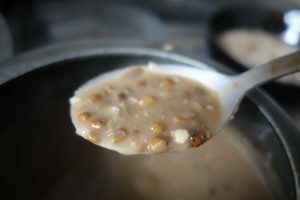 And you know what I love about this daal, that no matter this daal takes a lot of time to cook, this is one of the daals that you can cook in excess and then keep in the refrigerator.You can store it in the fridge for 2-3 days.After two days when you are again yearning for this creamy rich daal, just take out from the fridge, heat it thoroughly, add a little hot water if it is too thick . Make another tempering of ghee ( yes the more you add, the more it adds to the taste ),Jeera (caraway seeds), degi mirch powder and finely chopped onions and voila!!! Another meal is ready.. and believe me when I say, the second time it tastes more more yummy than the first time…yes it does!! And no.. I’m still not done with the uses of the left over Maa rajma daal. 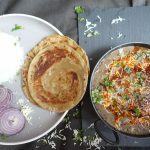 If you are in no mood to have this daal the second or the third day.. which I doubt will happen, but if it does the left over daal can be used to make amazing amazing crispy daal paranthas for the breakfast or lunch or dinner.I will share the recipe separately. 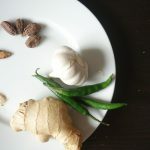 You can pair this with tandoori roti/ naan/ paranthas/tawa roti, or even rice.And if you are not looking for ways to lessen the amount of ghee in this recipe, do top your bowl of daal with another spoonful of warm melting ghee.My dad does it with most of the daals and vegetables, and yes….It just tastes delicious!!! You don’t have to do it with everything…. but do try it on this, and lemme know how you like it. Adding a sprinkle of grated paneer is another way to garnish this. It adds so much vibrance to this dal. Whatever you top it with, sprinkle a lil garam masala , fresh coriander. 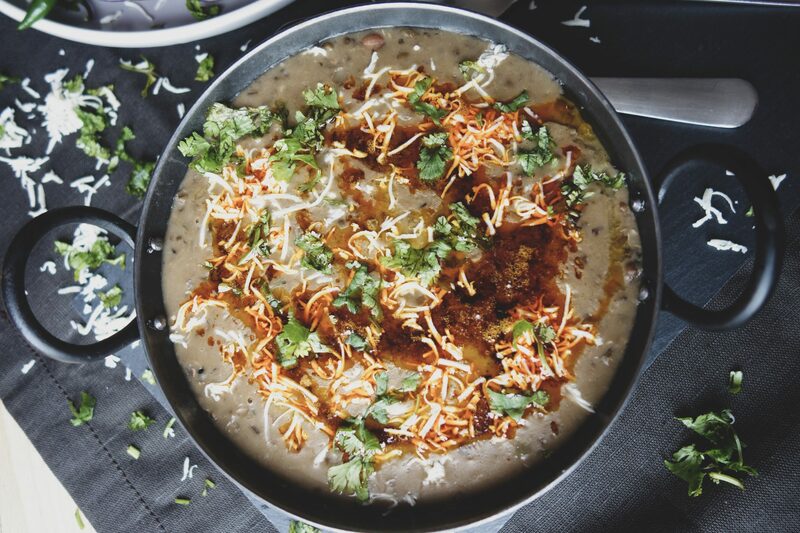 Have a side of pickled onions , vegetable raita, ready to be served with this punjabi dal. Im sure by now , you must be thinking… get the recipe out . So here’s the quick recipe of Maa Rajma Daal for you lovely people. A sumptuous creamy mix of whole black urad lentils and kidney beans with a mix of rustic Indian flavours. 1 tbsp grated paneer This is for garnishing and completely optional. 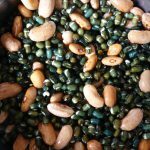 Soak whole urad daal (lentils) and rajma (kidney beans ) in water overnight. Before cooking, wash the mix thoroughly with water. 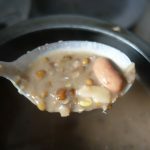 In a pressure cooker, add the soaked Lentils and beans mix, 6-7 cups water (for 1 cup lentils and 2 tbsp beans), and 1/4 tsp fenugreek seeds.Cook for 5-6 whistles. open the lid, once the pressure is all out. Then add mustard oil ,whole spices (cloves/ black cardamom/cinnamon stick), add salt, red chilli powder, hing (asafoetida),chopped green chillies, ginger and garlic. Close the cooker lid and on a medium heat, let it cook for 20 minutes. After 20 min, turn off the heat, and once the pressure is out, open the cooker lid. 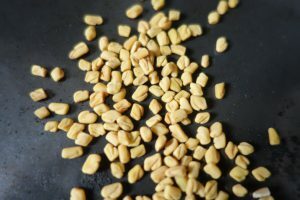 Add crushed kasoori methi (dried and crushed fenugreek leaves), mix well and cook daal on slow heat, for another 15-20 min, till it dissolves , and looks a little mushy. Heat 4 tbsp of ghee. Add caraway seeds (jeera), let them splutter. Add chopped onions and let them get a little crispy and light brown. 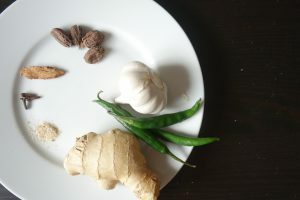 Add Malai. Almost all Indian homes have malai (fresh cream) readily available , but here in UK I do not have malai at home. I use the clotted cream instead and it works well in this recipe.You can also add the whipping cream if nothing else is available. Do not cook the tempering much after adding malai. Add this tadka (tempering) to the hot daal, and mix well. For the second tempering. You can add this while serving the daal. Once the ghee is hot enough, turn off the heat and add deli mirch powder. Immediately add it over the cooked daal. Now garnish the daal with grated paneer . This really looks good and blend well with the taste of man rajma daal( This is completely optional).Add fresh coriander and serve this with paranthas / roti/ naan or rice. 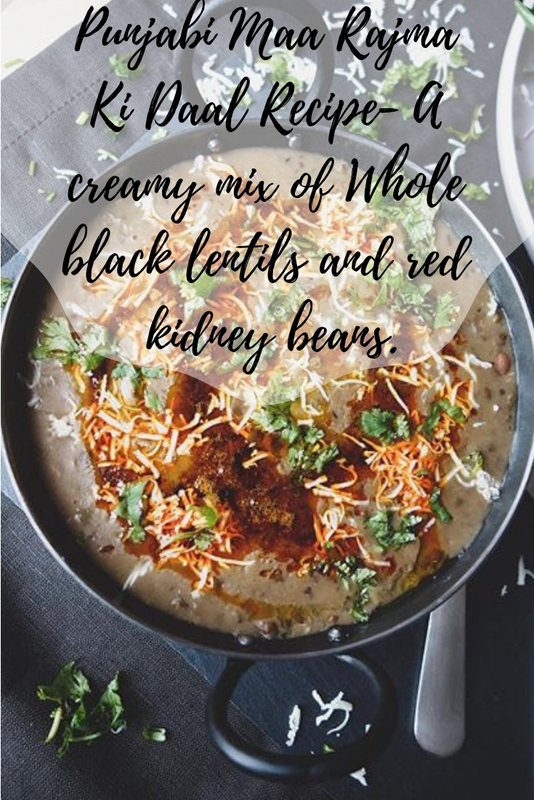 Maa rajma Daal Recipe- A sumptuous creamy mix of whole black urad #lentils and #kidneybeans with a mix of rustic Indian flavours. 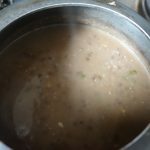 I have tried your daal recipe and it taste really awesome….